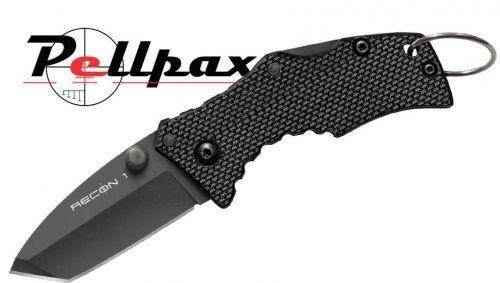 The Micro recon with a Tanto Point offer the same features as the spear but with a lot more power. The Tanto edge is ideal for piercing/penetrating things without having to put a lot of physical effort in. The Tanto point offers a deep penetration whilst the needle sharp cutting edge offer a easy and precise slicing/cutting ability. The steel has a Tuff-Ex coating to give it a high quality finish and protect the strong steel underneath. The 2" long handle is constructed from long G-10 material. This fiberglass/resin mixture has then been compressed and heat treated to ensure the handle is as sturdy as it can be. To create a more comfortable and user friendly handle the G-10 has been coated in Griv-Ex. This is a textured surface that allows a grippy and firm hold whilst not compromising the comfort. To ensure the precision of cutting remains high and the safety of the user does too, the Recon has been fitted with a finger grove to allow a better grip and keep your finger away from the blade when in use.